Every now and then, it's good to have a good, old-fashioned nightmare. 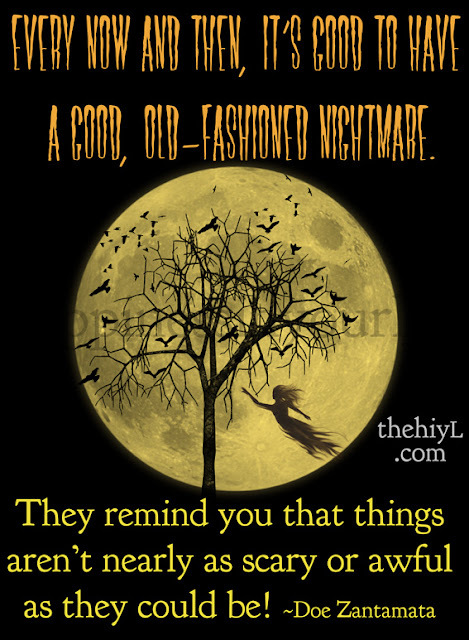 They remind you that things aren't nearly as scary or awful as they could be! I had an awful nightmare. I dreamed my dog came in from outside and was covered in a weird, red powder. His eyes were red and he was crying in pain. I looked at his fur, and under his belly was a weird, purple pod, with thousands upon thousands of tiny, white insects streaming out of it and biting at him and leaving that weird powder behind. They got on me, and started biting and stinging me, too. As I rushed to try to get him in the bath to try to rid him of them, I woke up...safe, and comfortable in my bed. He was sleeping on the floor, peacefully, with his soft, healthy, white fur clean and shiny. I hugged him and gave him cookies, and was so thankful that he is healthy and happy. So if everyone in your life is purple-pod, weird bug free, be thankful :) With all the hugs and cookies, my dog was probably thankful for my nightmare, too.